Laem Pak Bia sandspit … THE site for White-faced Plover, Malaysian Plover and Chinese Egret, plus a big gull and tern roost. Two fantastic days in this ultra-rich birding area of central Thailand, famous for its wintering shorebirds (especially the critically endangered Spoon-billed Sandpiper). I saw 124 bird species in the area during my visit, which is quite remarkable considering the only woodland habitat here is the rather bird-poor mangroves. This is the best-known site in the area for Spoon-billed Sandpiper. 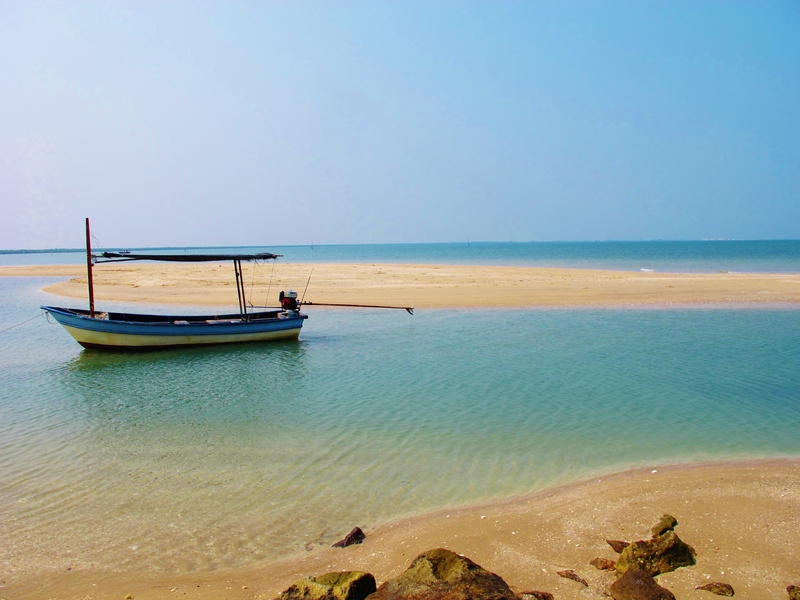 It’s an area of salt pans and pools just inland from the sea, well signposted from the coast road east of Phetchaburi. There are currently two Spoon-billed Sandpipers present at this site; with patience and a telescope they can be fairly easily found among the large numbers of stints and other small sandpipers here. Apart from the spoon-shaped bill, which can sometimes be surprisingly hard to notice, they can readily be told at a distance by their size (noticeably larger than Red-necked Stint), extensive white on the face, and feeding action. More subtly, while they loosely associate with Red-necked Stints, they tend to “do their own thing” instead of scurrying around with the stints. Also here, a large flock of several hundred Great Knot also held three Nordmann’s Greenshank, my most-wanted shorebird and the main reason I returned to Pak Thale after seeing most of the other specialities on my first visit two years ago. These endangered waders often seem to associate with the Great Knot flocks here. They are easy to distinguish from Common Greenshank, being somewhat paler and more uniform grey and white, shorter necked and shorter legged than their common cousin. The bill of Nordmann’s is especially thick-based compared to Common. To my eyes, they have a weird shape – rather pot-bellied, but the belly is squared off, like a squat and badly designed Common Greenshank. Another highlight at this location was perfect views, in excellent morning light, of a flock of perhaps 500 Mongolian Plovers and 200 Great Knots, which also contained low single-figure counts of Greater Sandplover, Red-necked Phalarope, Red Knot and Sanderling. Less than half a mile inland from Pak Thale, an extensive area of reedbeds and pools gives birders the opportunity to see birds that don’t occur on the salt pans and marshes of the coast. Even during my mid-morning and early afternoon visits on a rather windy day, there were plenty of birds to be seen – this site would probably repay an early morning visit on a calm day. Highlights here included Purple Heron, Cinnamon Bittern, Yellow Bittern, Painted Stork, Ruddy-breasted Crake, Bronze-winged Jacana, Grey-headed Lapwing, Chestnut Munia and Baya Weaver, with Plain-backed Sparrow and Indian Nightjar in a dry area nearby. Black-browed Reed Warblers were astonishingly numerous here, with at least one bird calling from every patch of reeds – a mist-netting session here could be very productive in finding rarer Acrocephalus and Locustella warblers. An area of dry scrub, salt pans and a rubbish dump near Laem Pak Bia, easily identified by its famous landmark half-completed building. Several visits here revealed a Spoon-billed Sandpiper (one of two in this area), an Asian Dowitcher, a Temminck’s Stint, and three Ruff among lots of commoner waders. A Peregrine hunted from the abandoned building, but there was no sign of the reported Brahminy Starling at the rubbish dump. A high tide visit with the legendary Mr Daeng, who doesn’t speak a lot of English but certainly knows his birds. The cost of the two-hour boat trip through the mangroves to the sand spit has increased to 1,000 baht since my last visit, but coffee and biscuits are now provided! We saw almost all the special birds here, with my main target Pallas’s Gull represented by no fewer than 5 individuals at the high tide roost (including 2 adults). Among the Caspian, Great Crested, Whiskered and Little Terns were 4 Lesser Crested Terns and 6 Gull-billed Terns. Just two Malaysian Plovers and two White-faced Plovers were seen, but views of both were excellent. We had to wait a while for a Chinese Egret, but the bird put on quite a show when it finally arrived – and we saw another on the way back through the mangroves. However, we didn’t see or hear Mangrove Whistler, which is rare and elusive here and very much an outside bet at this location. Just north of Laem Pak Bia village, this area of ponds and mangroves is a good place to see large numbers of birds at close range from the car. It was the only place we connected with Indian Cormorant and White-winged Tern, both of which are common here. We spent some time in the mangrove forest, which is rather poor in species variety, but the birds which do occur (Golden-bellied Gerygone, Dusky Warbler, Racket-tailed Treepie, Oriental Magpie-Robin and Pied Fantail) are very common. Again, we drew a blank with Mangrove Whistler. Late in the afternoon, we loitered around the experimental reedbed plots, where a Black-browed Reed Warbler showed several times and a Ruddy-breasted Crake gave reasonable views. Finally, after dark, we had spectacular views (down to two feet!) 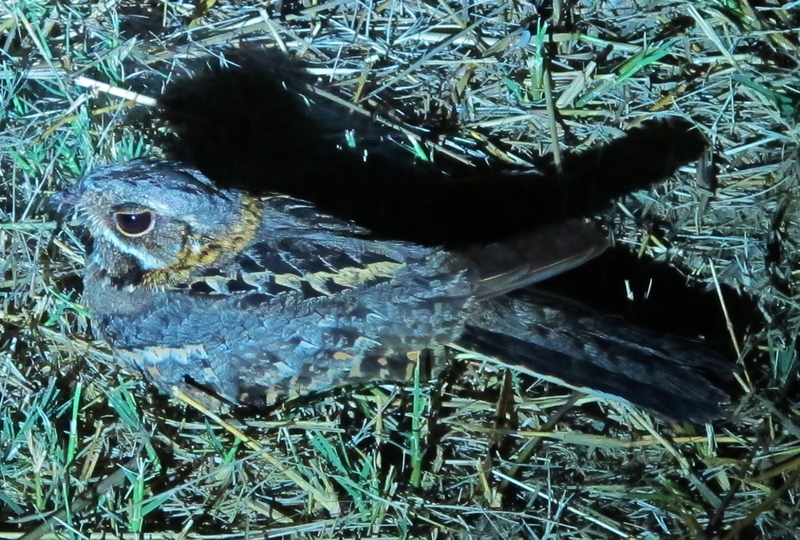 of an Indian Nightjar in flight and on the ground – a lifer for me and a fantastic way to end the day. Indian Nightjar at the King’s Project, Laem Pak Bia …. photo taken at a range of about three feet! Lifers: Nordmann’s Greenshank, Pallas’s Gull, Indian Nightjar, Baya Weaver (total 1,797). South-east Asia/Thailand ticks: White-winged Tern, Yellow Bittern, Ruddy-breasted Crake, Whimbrel, Ruff, Temminck’s Stint, Black-browed Reed Warbler (total 637). 2015 Year List current total: 230.